As we discussed in the previous articles, the highest office in our country is held by the President. The President of India holds first rank in the official warrant of precedence. Next to the President, the Vice President holds the second highest office of the nation. This model resembles to the American model of Vice President. In this article we shall discuss about the election, qualification, oath and powers of the Vice President. 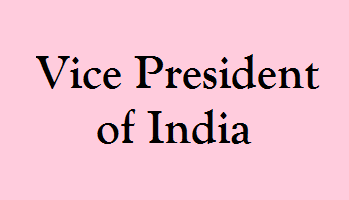 Just like we discussed for the election of the President of India, the Vice President is also elected indirectly. I hope by now the difference between direct election and indirect election is clear. The Vice President is elected by a special electoral college whose members consist of the members of both the Lok Sabha and Rajya Sabha. In the election of the Vice President, both the elected and nominated members of the Parliament can participate whereas in the case of President, only elected members of the Parliament could vote. The members of the state legislative assemblies do not participate in the election of the Vice-President but during the Presidential elections, the members of the state legislative assemblies have the privilege to vote for the President. To justify this difference in the election procedures between the President and the Vice President, Dr BR Ambedkar reasoned that the President is the head of the country and his powers and functions include the administration of both the State Government and the Union Government. Therefore it is important for the members of the State legislature to have a say in his election apart from the members of the Parliament. However under normal circumstances, the functions of the Vice President of the country are limited to presiding over the state councils. Therefore it is not necessary for the members of the state legislatures to participate in his election. I would like to stress that during certain circumstances, when the President is either indisposed or absent and the office of the President is vacant, then, the Vice President can be called to take up the duties of the President which makes his election to be as important as the Presidential elections. The process for the election of the Vice President and the President is mostly similar. Just like the Presidential elections, the election of the Vice President is also conducted according to the system of proportional representation and Single Transferable Vote. Voting is also conducted by a secret ballot. 1. The candidate should be a citizen of India. 2. The candidate should be at least 35 years of age. 3. The candidate should be qualified to be elected as a member of the Rajya Sabha. 4. The candidate should not hold any office of profit under any State government or Central government or any other local authority or public authority. We know that the President of the country, Vice President of the country, the Governor of the states and the ministers of Central Government or State government are not allowed to hold any office of profit. Therefore the above mentioned people are eligible for the Vice President election. Moreover, the candidature of a person for the Vice Presidential election should be supported by at least 20 electors who propose his name and 20 other electors who should second the proposal. In case of the election of the President, the candidature of a person should be proposed by at least 50 electors and 50 other electors should second this proposal. Just like the Presidential elections, every Vice President candidate needs to deposit Fifteen Thousand rupees in the Reserve Bank of India as a security deposit to weed out non serious candidates. 2. To faithfully perform the duties of his office. The Oath is taken in front of, and administered by either the President or a person who has been appointed by the President on his behalf. 1. According to the Indian Constitution, the Vice President should not be a member of either House of the Parliament or State legislature. The official term for a Vice President is 5 years from the day he starts his tenure. He can resign from his duties at any time by submitting his letter of resignation to the President of the country. The Vice President can also be removed by a simple resolution in the Rajya Sabha, which is passed by an absolute majority. Such a resolution must be approved by Lok Sabha. Before passing such a resolution, a 14 days advance notice must be given to the Vice President. However the grounds for such a removal of the Vice President have not been mentioned in the constitution. 1. The Vice President acts as the chairman of Rajya Sabha. The powers of the Vice President as the chairman of the Rajya Sabha are similar to those of the speaker of Lok Sabha. This is similar to the American Vice President who is also the chairman of the Senate which is the Upper house of the American legislature. 2. The Vice President acts as President whenever a vacancy occurs due to the resignation, removal, death or otherwise. The Vice President can only act as the President for a maximum period of 6 months from the day the vacancy was filled by him. Moreover, the Vice President can also act as President if the President is not able to perform his functions and duties due to absence or illness or any other reason. When the Vice President is acting as the President of the country, then he does not perform his functions as the chairman of Rajya Sabha. During this time, the Deputy Chairman of Rajya Sabha performs the functions of the Chairman of Rajya Sabha.